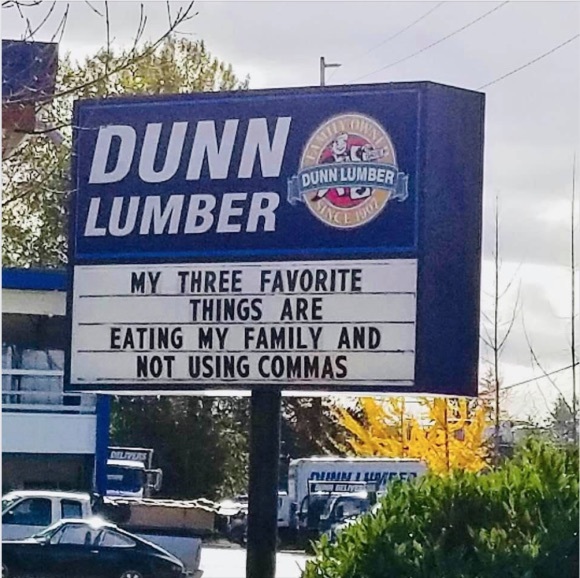 It seems that Dunn Lumber (ten locations in the Puget Sound area) is famous for posting such thought-provoking, mind-bending messages on the sign outside its store. I know: Eats, Shoots & Leaves: The Zero Tolerance Approach to Punctuation. For the record, I am a strong advocate of the Oxford / Harvard / series / serial comma, and am forever correcting my students when they fail to use it. The example in the sign is not an instance where the presence or absence of an Oxford comma makes a difference, though. A question to proponents of the Oxford comma: would you use a comma before "and" if there are only two items? If not, why not? Why "eats, shoots, and leaves" but not "shoots, and leaves"? My personal use of the Oxford comma is governed not by the number of items in the list but rather by whether the penultimate item would be followed by a pause when spoken. Thus "he shoots, and leaves through the side door" (i.e., he did not shoot through the side door, or if he did, it is irrelevant to the narrative) but "he shoots and misses" (no pause when spoken). To borrow from another well-known apophthegm "Oxford commas are for the guidance of the wise and the blind obedience of fools" (VHM excepted, of course !). The Oxford comma only applies for series of three or more items. It seems awfully prescriptivist to 'correct' a usage which is standard in British English and many other languages. In my native tongue, a comma preceding 'and' indicates that it is used as a copulative conjunction, ie that what follows is an independent clause. It also has a number of other very specific rules on when to use and not to use commas, and as a result hardly anyone gets it completely right. The relative freedom which English affords its users when it comes to when and how to use commas is something I, in my humble opinion, find should be celebrated. The serial comma is problematic because it can both reduce and introduce ambiguity. This is the result of the ambiguous nature of "and". Fortunately, in English, we have two ways of expressing "and": "and" and "&". A modest proposal: 1) Use serial commas solely to denote appositives. 2) Use "and" for the coordinating conjunction 3) Use "&" when joining together two items in a list. My parents, Ayn Rand and God. My parents, John & Susan. They went to Oregon with Betty, a maid, and a cook. To my eyes, the first verges in blasphemy (not that I believe in such a thing, but I think you will understand what I mean); were I to write it, the serial comma would be essential. When typesetting menus (something I do fairly frequently), I used both "and" and ampersands, as in (e.g.,) "Grilled Fillet of Sea Bream — Served with an orange butter sauce, roasted red pepper, and crushed potatoes with watercress & chives". Ah, but what would you do in cases where the serial comma *creates* ambiguity? E.g. My mother, Ayn Rand, and God. The serial comma leads to it being unclear as to if "Ayn Rand" is an appositive OR another entry in the list! The problem is that the serial comma giveth, but it taketh away in equal measure. Furthermore, if I'm reading your example right, the use of "and" vs ampersands fits quite well with my proposal: it is readily clear that "watercress & chives" are the addition to the potatoes, as opposed to the dish being "crushed potatoes & watercress", followed by the separate entry of "chives". That's the first time I've liked an ampersand. Thank you, E.Z. The Oxford comma — and this is from a former strict believer — works when it is needed. It should be sophisticated, knowing to leave when it is not needed, and a hero, rushing to the rescue when confusion is truly threatened. I have a strict policy regarding the serial comma — sometimes I put one in and sometimes I don't. The problem with perhaps the best-known "commas are a matter of life and death" example, "let's eat grandpa / let's eat, grandpa," is that no one in their right mind would interpret the first as an invitation to cannibalism. That's why it's funny: two readings, one of them impossible, and the impossible one is suddenly the literal one. Commas MAY count in written language, sometimes, particularly in legalistic contexts, but even there, if meaning were clear, lawyers would have more time for golf, or corpus linguistics. Cf Kenneth Adams' Drafting without punctuation. "My parents, Ayn Rand and God." I've always thought this a lousy example (though amusing) since there is absolutely no chance of ambiguity if you know even the slightest thing about Ms Rand—or God, for that matter.